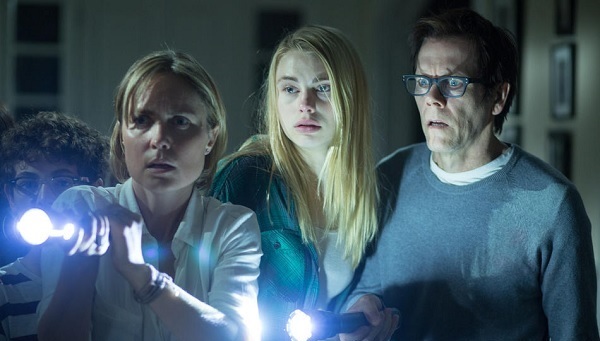 Blumhouse Films has easily become one of the most well-respected names in horror as of late. Their catalogue of theatrical releases and straight to DVD/VOD offerings are always met with grand anticipation, and for good reason. Aside some bland offerings as of late, the company has released some of the most exciting films and franchises for all walks of horror fandom. Their latest effort, The Darkness, was greeted with plenty of excitement as well. However, the theatrical run saw plenty of mild reviews much like their recent films Unfriended, The Gallows, and especially Ouija. But was the movie as bad as many make it out to be, and does the blu-ray version offer anything worth giving it a second chance with the detractors? The Darkness is the story of a family vacation gone awry. The Taylor family heads to the Grand Canyon with another couple and their son. 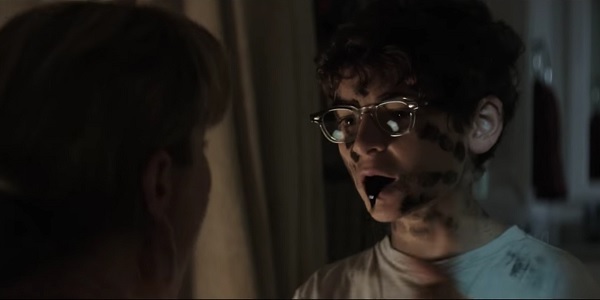 The kids venture off to explore, allowing a moment for exposition about the son Michael seeing the world differently (though never directly citing a condition so let’s assume it to be autism) and how he’s not afraid of anything. When daughter Stephanie (Lucy Fry, 11.22.63, Vampire Academy) and the other boy wander off, Michael (David Mazouz, Gotham, Touch) does too, falling into a hole and discovering a small shrine with five stones with markings on them that reflect a specific spirit animal. He takes them home without telling anyone, and the family begins to unravel over the course of the next few months, leading to the discovery that the stones trapped native american spirits that are slowly coming forward to take Michael away, driving the family to a pair of spiritual sensitives referred by Michael’s boss’s wife. If this story sounds familiar, that’s because it kind of is. Anyone who has seen Poltergeist will have a good idea of what’s going to happen as the story continues to unfold. The cast, however, seems to think it’s more of a Lifetime television movie event than anything remotely horror related. Given the star-studded casting, it’s hard to argue that possibility, especially the bouts of over-the-top acting that happen between Stephanie and her mother Bronnuy (Radha Mitchell, Silent Hill, Pitch Black) who seem to have sudden daytime soap opera shifts in attitude towards one another. Even Bronny and her husband Peter (Kevin Bacon, Footloose, Mystic River) have their moments where you’d swear this were a high funded production of The Young and The Restless. Honestly, it’s a shame that some of the more powerfully acted scenes seem to come on sporadically and have little to no relation to the main events slowly unfolding. As for the visual appeal, the blu-ray version of the film touts that it has “HD Picture” and “Theater Quality Sound” and, yes, both seem to live up to those standards quite well. The audio is about what you would expect on this medium for a home theater system and, visually, The Darkness looks sharp and crisp, pulling out every single detail possible for a non-4K presentation. In fact, I think there might be some components of that on here if not the result of a bad pressing from the factory, as there are scenes where actors or the background behind them show odd pixelation, as if a poor green screen effect the computers couldn’t keep up with. Surprisingly this happened mostly in the kitchen where they clearly are in a house during the day without need of such effects. Outside those few random moments early on, I was highly impressed with how it looked on-screen, but almost immediately taken back by it. This is a horror film after all, so it doesn’t take long before you start to wonder just how much this crisp presentation will affect the overall film and, well, it does. For one thing, the computer effects look terrible when used due to it. Whenever the ancient spirits manifest such as reaching out through the portal, it looks completely fake. There are very few practical effects and those are usually like a random snake placement or the incredibly happy looking wolf walking between rooms meant to be intimidating. Even the silhouette of the buffalo looks like a cardboard cut-out but is more believable than some of the other computer generated imagery like the final dark one that appears in the alternate ending. Consider some of these a step or two higher than what you’d find in a SyFy Channel original from The Asylum. Right from the start you get the sensation that they happen to be a normal, every day family with a son who suffering from autism. After the trip to the Grand Canyon, however, we’re presented a film that essentially just shows a financially stable white family with everyday problems. There are issues with the marriage which is later revealed to be exactly what you think they are. You have the adultery angle, the typical alcohol coping mechanism, the avoidance of Michael’s mental state, temptation at the workplace, the list goes on from there. As for the kids, it’s mostly just coping and other random issues that could have been worked into the story a lot better. Stephanie’s secret i a good example, leading viewers to expect the boy she was with may have impregnated her at the Grand Canyon, thus being the main reason the spirits are there and why she loses it whenever her mother comes into her room unannounced. But, nope, it’s not, and the real reason is only mentioned once briefly and only brought up once again later on. As mentioned, there are deleted scenes that show some build-up to Stephanie’s actions and the results of them left on the cutting room floor. A few really are pointless, but one or two do show the progression of time and what more happened following said discovery. One or two of the scenes of Stephanie talking to her friends would help the aforementioned “secret” angle, and even the hotel scene that shows the lack of safety outside the house aid in answering the question of why they didn’t just move out if they were safe there overnight. You actually know why but given the placement of the scene you’d have no idea. And then there’s the alternate ending, which you have kind of already seen. Not only is it laughably bad, but it has been cut up and strewn about the film with a new ending reshot with what seems like b-roll footage tacked on the theatrical version as a sense of closure. While the conclusion is as hysterical as the zombie giraffe shaking the one girl in the air by its mouth was in Zoombies, it would have helped keep a little pacing to the overall story. Had they just chopped the car segment out, or found a way to make it that the spirits do get Michael in the end and kept the conclusion left in the released version, it would have made for a better, more complete experience. Sadly, if you’re expecting more content to get a better feeling about the film and anything that might have happened behind the scenes, well you’re out of luck. The deleted scenes and alternate ending is all the bonus content this film offers other than a digital download code if purchased on blu-ray. No commentary, no interviews, not even any of the promotional trailers or film stills. Instead we have a service that downloads the latest trailers for upcoming movies if you care enough to see what might be relevent to viewers of this film. Truthfully, this is a barren experience when it comes to bonus content, something that has been happening a lot lately from both big name and independent publishers, and it really needs to stop. But, really, these are merely the aesthetic gripes. The overall problem of The Darkness as a whole is that the story is as vanilla as it could be. You can describe the whole film as “People Have Problems: The Movie (but with ghosts)” or “Coping With Life: The Movie (but with ghosts)”. The horror aspect seems like nothing more than an after thought. A Blumhouse template tacked onto an otherwise decent Family Channel film of an ordinary family coping with their son’s mental problems. Hell, when Stephanie freaks out about Michael’s problems, how they affect everyone, and how her parents just ignore it felt more at home with s Lifetime Original movie than anything else and, really, those subtle outbursts are where the film genuinely excels at. Viewers can start to relate in that sense, but none of it is ever fleshed out. It’s like the film is relying on one thing after another to earn your sympathy for the family like the pilot episode of Fox’s The Pitts. Instead it’s all hidden deep within another generic Poltergeist knock-off. This ends up being yet another entry to the current Blumhouse theatrical trend. While the company does have a number of fantastic films under their belts, most of those are the kind that go to video on demand or DVD instead of into theaters first. There’s almost a pattern of mediocrity that goes into anything shipped to the cinema’s outside the exceptions of The Purge and maybe The Lazarus Effect. There’s absolutely nothing in this film, released or deleted, that seems to take any sort of chance to be memorable. Instead we have yet another Ouija, The Gallows, even Unfriended despite it still being a bit of an insult to that latter film’s Skype driven plot device, and its a shame given this is the same company that gave us The Bay and Dark Skies among a few other hidden gems. 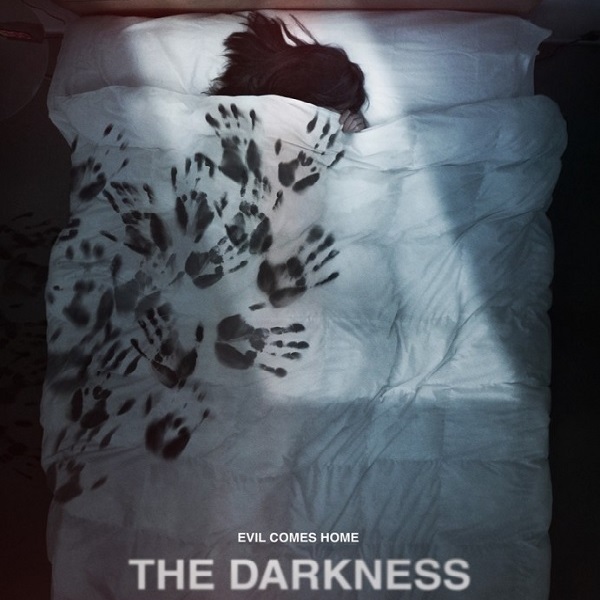 The Darkness is yet another film to cash in on the Poltergeist template to make a quick buck. However, the additional scenes thrown onto the blu-ray and DVD versions will help you appreciate it a little more given what the ending could have been. It’s unfortunate the people who edited the film did it the way they did for theaters, as there was a somewhat better cut of the film sitting there, ready to be released. Whether or not you can justify spending the money on such a surprisingly bland story given the superb casting choices that do their best to give this movie a little more life is up to you. But, if you enjoyed Ouija, chances are you’ll enjoy this one. If you want a little more substance, character development, practical effects instead of unneccessary computer graphics, or anything not ripped off from Omen, then this won’t really tickle your fancy. Digital review copy of this release provided by Universal Home Entertainment via Mammoth Advertising.